Customize your ride, if your stock seat is no longer comfortable or you need a different shape with more padding give us a call. Mustang seats are model specific for Honda, Yamaha, Kawasaki, Suzuki, Victory and more motorcycles. Most are easy install. Kelly's Cycle is a Mustang seat dealer. 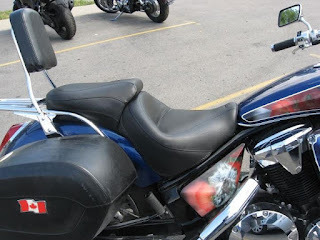 We can get you the right seat for your motorcycle. Here's what Vincent had to say after installing a Mustang seat for his Honda VT1300 Interstate. "The new Mustang seat I bought at Kelly's!! It made for a much more comfortable trip home to Alberta. I was able to ride 1347 km in one day, thanks in many ways to this seat!!" See more about Vincent's Honda VT1300 Interstate. Contact us to buy a Mustang seat, we ship.